You are here: Home / Misc. / Book Club/Book Reviews / Interview; D. Revolution: A Journey of Finding Self through Hardship. (ThyBlackMan.com) I love reading stories of challenge, overcoming obstacles, self-searching and redemption. 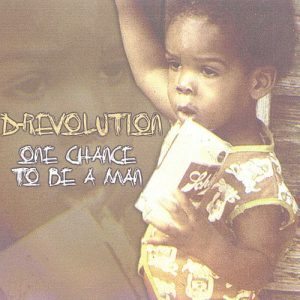 D. Revolution’s “One Chance to be a Man” takes the reader on a very intimate journey of a man searching for purpose and peace in a world of hardship and chaos. The author bore his soul in the pages with no filter as he gives voice to those that come from places whereby hope can be as difficult to come by as ones’ next meal. ThyBlackMan.com had an opportunity to talk to D. Revolution about what gave birth to this book, and where he is on his journey now. TBM: What motivated you to write this book? D. Rev: One motivation of mine to write the book was to tell my mothers’ story. I promised her, before she passed that I would tell her story. I also wanted to tell my story on how living as a young black man in America sometimes we feel there is no hope. I had the desire to be something more; talking about how I came from the streets of Chicago to become an award winning poet, and the journey of getting there. I want other young black men, and people period Americans, to read the story and understand the truth of how hard it is just to gain a few steps in this country as a young man. TBM: I read the book, and though not from Chicago, I recognize some of the same challenges being from another city. How do you address the dynamic of circumstance verse choice? D. Rev: I think when you are in a particular environment I believe circumstance and choice are the same thing. You are really making your choice because of circumstances so you are looking at them as one in the same. You are being raised in said particular environment such as Chicago which is is in the news every day because they choose to put it there, when in my opinion it has always been what it is now its just being exposed in the media, I saw circumstances and choices running together as I tried to get out of Chicago…and if had an effect on the things I did to survive. TBM: Where has the journey taken you now verses the spaces you were in within the book? D. Rev: I’ve built somewhat of a legacy in Nashville, TN as far as a spoken word artist and poet. I still have to deal with my personal life just being a man and how some of my childhood experiences have gotten in the way of me doing different things. As a poet living in local popularity also became a problem. I encountered the issues of being D. Revolution verses being Don, and it played to a point where I am still searching, as in the book, for someone to love me. I’m alone and I find myself back in a familiar situation now. Just personally I’m still trying to be something more; I’[m striving to survive and be something in my life…in that aspect not much has changed. The desire to be something is still apart of my struggles every day. TBM: What do you want readers, men or women, to take away from your story? D. Rev: I want people to know the truth, and I wrote the story as honest as I could. I wouldn’t have written it any other way. I want men to know you have to desire to change and be something. Always keep your mind in a positive place. I can’t tell a young man to do some of the things they are doing when they are trying to survive…they are trying to eat. I grew up hungry…literally hungry trying to survive and eat. What I would say about women is the book will really put you in the mindset of a young man, like myself, that grew up in said environment. It can give you an insight into how some men think because the way I was with women, during that time I was toxic to women thinking that the way I was behaving was correct. Sometimes women want to know why some men act a certain way. I feel this book shows a certain mentally that would give women an understanding as to why some men think a certain way. TBM: Do you want sisters to think this is the way men think, or some men trapped in certain circumstances? D. Rev: Some men in certain circumstances as obviously the environment matter. If you don’t have a particular background and family structure coming up in a poor environment that environment is going to show you things that are true and show a mentality that seems excepted. I have friends that’s not from my background and their life is totally different due to environment. They went to a very different school, neighborhood, and had both of their parents so they look at life totally different. This also applies to women; ones that came up in different environments respond to circumstances based on such. Granted it’s not for everyone because so much is backed on the key word which is environment. D. Rev: I’ve been told by others I should write another book, and I really might consider doing such. It is important that we support narratives written by our people whereby they tell us a truth that can change our life. You won’t regret getting a copy of D. Revolutions “One Change to be a Man” and allowing his truth to become real to you. Stories like this one direct us to the work we need to support in our community. The author often talks about environment in this book, because it is a major theme that drives the choices we make on a daily basis. We must invest in giving our children an environment that will pour life into them so that their journey one where hope is always available to them. As a reader I definitely hope a book two is written as I believe this brother has more to teach us about the life some of our people are living as he walks us through his life.